After Hitler came to power in 1933, Charlotte Beradt, a Berlin-based journalist, began to awaken night after night bathed in perspiration, teeth clenched in terror. On one of these nights, after dreaming of being hunted “from pillar to post” by storm troopers, a new thought arrived: what if she wasn’t the only one? What if the things that appeared in her nightmares were also being visited upon other people? This startling thought set in motion the seeds of a research project. Beradt quietly began to query people about their dream-life, documenting the nocturnal visions the regime had induced as "new and explicit proof of the dictatorship." This turned out to be no easy task. People were reluctant and sometimes afraid to confide their dreams. Beradt reports a half a dozen instances in which individuals dreamed that it was forbidden to dream (but did so anyway). She canvassed a broad cross section of the population: from students and lawyers to manufacturers and housewives. Altogether, she obtained dream reports from more than three hundred Berliners. As a Jew, she was eventually compelled to leave the country, and in 1939, she and her husband made their way to New York, where they joined a community of exiles—a “tribe” of ex-Berliners that included Hannah Arendt and Heinrich Blücher. During the war, a New York–based leftist magazine called Free World published a short article about her collection of dreams (reproduced below). In 1966, with Arendt’s help, Beradt published a book-length study under the title, Das Dritte Reich des Traums. An English-language edition, The Third Reich of Dreams, which included an essay by Bruno Bettelheim, quickly followed in 1968. 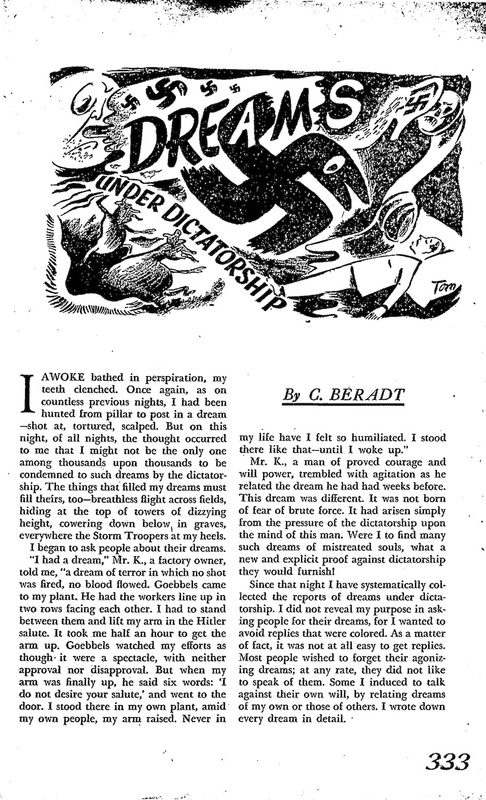 Charlotte Beradt, "Dreams Under Dictatorship," Free World (October 1943), 333–37. Click on a page to enlarge. —Sharon Sliwinski is the creator and editor of The Museum of Dreams and a professor of Information and Media Studies at the University of Western Ontario in Canada. This discussion of Beradt’s Third Reich of Dreams is based on an excerpt from Dreaming in Dark Times, published by the University of Minnesota Press in 2017.